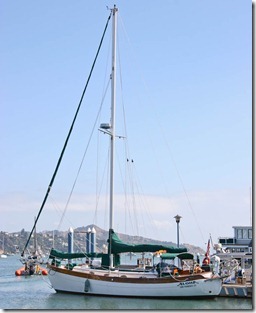 Serenity is our 1984 Hans Christian 38’ Traditional Cutter. She is our home, our transportation, and our adventure. If you’re curious you can read about our experience purchasing her. And of course she’ll be a feature of many posts to come. 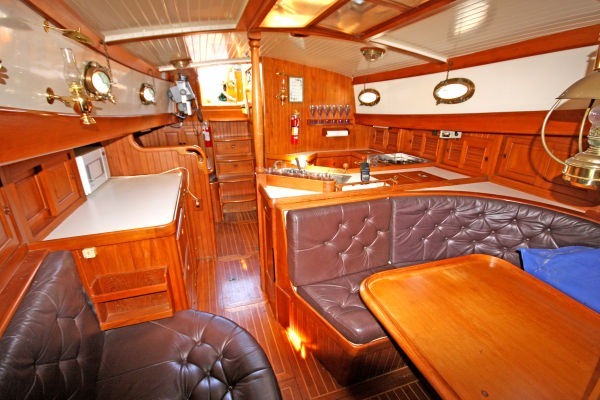 The first thing you notice about Serenity when you see her is the massive amount of teak, and the classic style in which she is built. 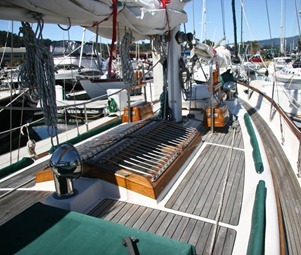 Her decks are teak over fiberglass, she has bulwarks with a teak cap rail, the mid ships are dominated by a large teak butterfly hatch, and she has large teak lockers on deck. These features are, in my opinion, some of what makes her such a pretty boat. However, they also entail a lot of maintenance. 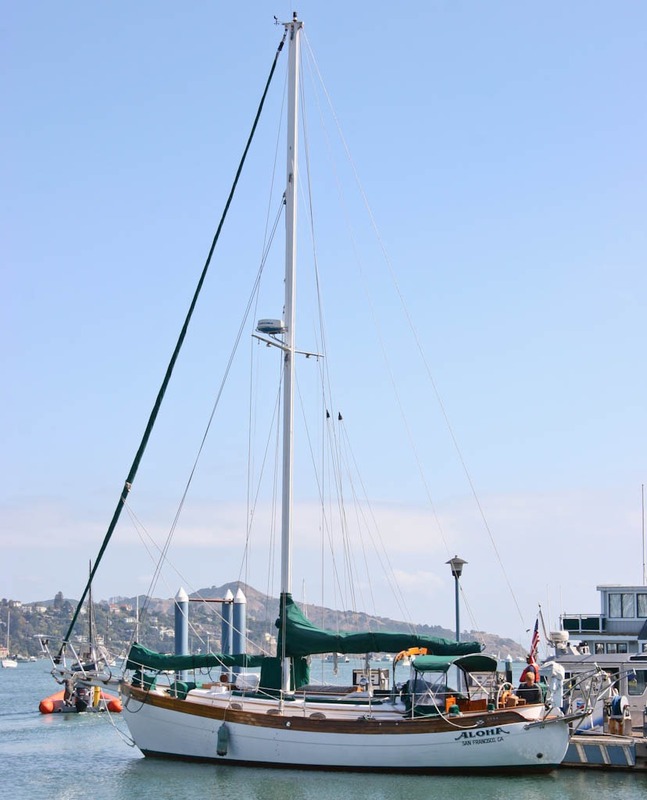 She has a single mast with two headsails, making her a cutter rigged sloop, which come with several advantages. Sail area can be significantly reduced by furling the jib (the outer headsail). The staysail is fitted with a boom which means it’s self tending (i.e. it requires no adjustments during a tack). This simplifies single handed tacking. 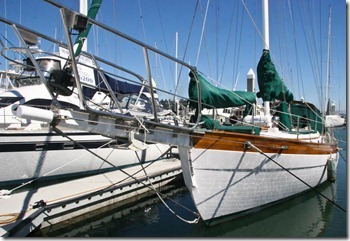 The jib is mounted end of a large bowsprit. This bowsprit combined with the small platform at the stern called a push pit, make the actual length over all 46’ despite the name being based on the almost 38’ length on deck. Below decks, you enter between the aft cabin on the port side, which is small but enclosed, and the nav station on starboard. Just forward of the aft cabin is the galley, which is fairly large, well enclosed, with easily accessible stove, oven, sink, and two refrigerators. Forward of the galley is the main salon, with a U shaped settee around a table with seating for 4 to port, and another settee to starboard. Forward of the salon, is the doorway to the main cabin and head. 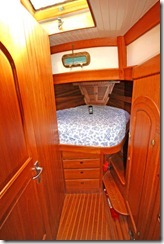 The main cabin is in the bow, and is a V berth, and shares a door with the head which is to starboard. 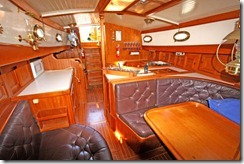 The main cabin has a hanging locker and quite a bit more storage that the aft cabin. The interior also features a lot of woodwork, brass, and black leather upholstery which give the cabin a rather austere look. 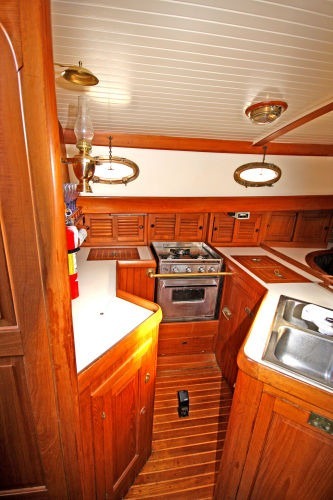 Amenity-wise Serenity has air conditioning and hot water when connected to shore power, as well as pressured fresh water, manually pumped salt water, propane stove and oven, refrigerators, AC and DC outlets, and a flat screen. 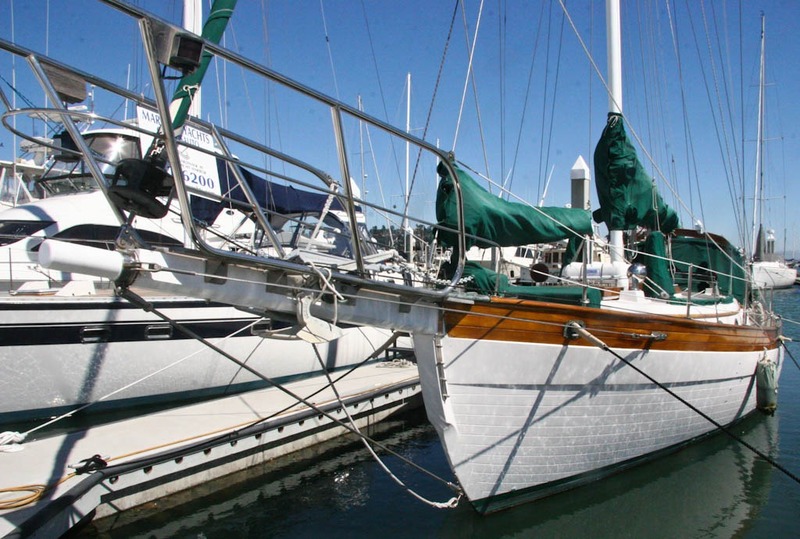 As far as sailing and seaworthiness go, she is what’s referred to as a “heavily laid up” vessel. She has a traditional full keel, a deep draft of 6 feet, a thick hull, heavy ground tackle (anchors) and a windlass. Put this together and you’ve got a boat that should fair well in seas that would send lighter boats running for shelter, and will hold well at anchor in moderate surge and wind. Her weight and draft also mean more pleasant motion in moderate seas. However, all this comes at the cost of performance, so let’s just say that Serenity won’t be winning any races. 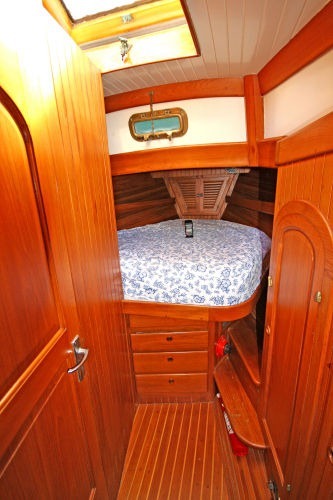 She has bunks for 6, although 4 would be more comfortable for any appreciable period of time, and we hope to have visitors for much of our travels. If you know us well, or even if you only know us a little, and you’re at all interested in meeting us somewhere you shouldn’t hesitate to ask. And in case you’re wondering, she is named for the vessel in the TV series Firefly. Some people might find this corny, but we can’t help loving the show, and we feel the same way about our ship as the characters feel about theirs. Hi – I am practically ready to dive into buying a 38T Telstar – would love to hear more! 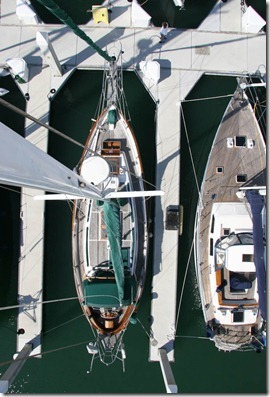 I am also in the bay area… These are gorgeous boats!